1594/3150, CENTER CAP USED, 88-92, FORD TEMPO, TOPAZ, METAL CAP, PAINTED SILVER NO LOGO, METAL CLIPS. 2-1/4" DIA. ORDER UNDER 3150 CENTER CAP. Price: ORDER UNDER 3150 CENTER CAP. 1594/3150, CENTER CAP USED, 88-92, FORD TEMPO, TOPAZ, METAL CAP, PAINTED SILVER NO LOGO, METAL CLIPS. 2-1/4" DIA. FOR A 14", ALUMINUM 6 SPOKE. ORDER UNDER 3150 CENTER CAP. 1618, Used Rims, 16x7, 6 STUD, 5-1/2", 88-91, Chevy, GMC, TRUCKS, 4X4, 6 SPOKE ALUM. 2036, Used Rims, 15X6, 6 LUG, 4-1/2", 94-95, DODGE, DAKOTA, 6 SPOKE ALLOY. 2079, Used Rims, 15X6, 6 LUG, 4-1/2", 1996, DODGE, DAKOTA, 6 SPOKE, GRAY POCKETS, ALLOY. 2079, Used Rims, 15X6, 6 LUG, 4-1/2", 96, DODGE, DAKOTA, 6 SPOKE WITH GRAY POCKETS, ALLOY. 2168, Used Rims, 16X6, 5 LUG, 100MM, 01-05, CHRY, PT CRUISER. ALUM CHROME CLAD/PLASTIC SKIN, 6 SPOKE. 2188, Used Rims, 16X7, 6 LUG, 4-1/2", 03-04, DODGE, DAKOTA, DURANGO, SILVER, 6 SPOKES, ALLOY. 2216a, Used Rims, 17X7-1/2, 5 LUG, 5", 04-08, CHRYSLER, PACIFICA, CHROME ALUMINUM 6 SPOKE & 6 NARROW SLOTS IN SPOKE. 2216a-2, CENTER CAP USED, CHROME, 17", 04-08, CHRYSLER, PACIFICA. CHROME. 6 SPOKE, NARROW SLOT. GOLD LOGO, 5 PLASTIC CLIPS, WIRE RING, 6-3/4" DIA. 2216a-2, CENTER CAP USED, CHROME, 17", 04-08, CHRYSLER, PACIFICA. CHROME 6 SPOKE NARROW SLOT WITH GOLD LOGO, IN CENTER, 5 PLASTIC CLIPS, WIRE RING, 6-3/4" DIA. NOTCH IS 1/2", A & B NOT INTERCHANGEABLE. A-1=SILVER LOGO. 2216d, CENTER CAP USED,04-08, CHRYSLER, PACIFICA. SPARKLE SILVER,CHROME EMBLEM, 6 SPOKE WIDE INDENT ON EDGE MATCH SPOKES. 6-3/4" DIA. 2263, Used Rims, 18X7-1/2, 5 LUG, 4-1/2", 05-06, CHRYSLER, 300, POLISHED WITH ROUGH SILVER POCKETS IN SPOKE, 6 SPOKE ALUM. 230, Hubcap used, 15", 66-68, JEEP, WAGONEER, SUPER WAGONEER, 6 SPOKE WITH SPINNER. 2347, Used Rims, 17X7-1/2, 5 LUG, 04-08, CHRYSLER, PACIFICA, ROAD, 6 SPOKE, CHROME WITH PAINTED SILVER POCKETS & CENTER OF SPOKE, EXPOSED LUGS. 2383, Used Rims, 17X8, 8 LUG, 6-1/2", 2010, DODGE, 2500, SMOOTH, 6 SPOKE, POLISHED, ALLOY. 3017, HUBCAP USED,, 14", 68-69, CHEVY, CAMARO, PASSENGER, CHEVELLE, NOVA, 6 SPOKE MAG TYPE. 3039, HUBCAP USED, 14", 1970, CHEVY, CHEVELLE, METAL, CHROME & BLACK, 6 SPOKE TYPE. RAISED CENTER WITH BLACK OUTLINED BOWTIE & BLACK ENGRAVED WORDS CHEVROLET MOTOR DIVISION ON OUTER EDGE OF CENTER,METAL CLIPS. 309, HUBCAP USED, 14", 67, DODGE, CHARGER, PASSENGER, 6-SPOKE TYPE. 3121b, HUBCAP USED, 15", 77-88, GMC, JIMMY, TRUCK, VAN, SUBURBAN, 1500, 2500, STAINLESS, 6 SPOKE WITH 6 DARK GRAY SLOT, DARK GRAY CENTER WITH RAISED CHROME GMC IN CENTER, W/O HUB HOLE, METAL CLIPS. 320, HUBCAP USED, 14", 67-69, PLYMOUTH, BARRACUDA, VALIANT, CHROME OUTER RING, 6 SLOT TYPE, 6 SPOKE & 6 PAINTED POCKETS. RAISED CENTER PAINTED BLACK, ENGRAVED LOGO IN CENTER, METAL CLIPS. 3215, Used Rims, 15X6, 4 LUG, 4-1/4", 97-00, MERCURY, MYSTIQUE, ALUM, 6 SPOKES. 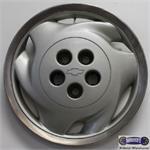 3216, HUBCAP USED, 14", 94-96, CHEVY, CORSICA, MACHINED OUTER RING, PAINTED SILVER, 6 SPOKE, 3 LARGE, 3 SMALL SPOKE SWEPT. ENGRAVED BOWTIE & 5 LUG NUT HOLES, HELD ON BY LUG NUTS.